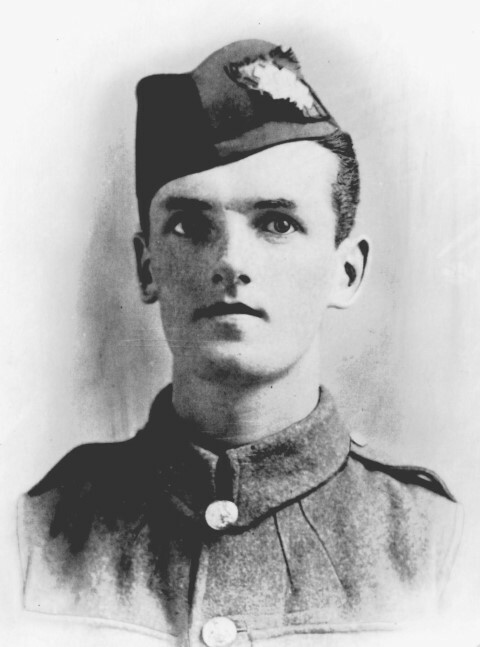 332883 Lance Corporal C. Brown, 9th Battalion, the Highland Regiment was killed in action 20 May 1917 and is commemorated on the Arras Memorial. He was 21 years old and is also commemorated on the Butterknowle War Memorial and the memorial plaque in St. John the Evangelist Church, Lynesack. In 1901, the family lived at Copley Bent. Cornelius’ father, Thomas was a barber and his brother Thomas worked as a coal miner. By 1911, the family still lived at Copley Bent, Thomas, Eliza, Ethel and Nellie worked as hairdressers. Marmaduke and Herbert were coal miners (hewers), Cecil and 16 year old Cornelius were recorded as coal miners. 6am: Brigade order No.234 received intimating operations of 100th Bde on HINDENBURG LINE on 20th May. 6.30pm: Battalion moves from bivouacs to Rendezvous close [to] MAISON ROUGE farm where tea is taken prior to moving to place of assembly at T13 c 5.5. 9.15pm: The Battalion left Rendezvous for place of assembly. As the battalion passed through CROISSILLES and along the bank of the SENSEE River it was heavily shelled. Fortunately it succeeded in reaching the position of assembly with [only] about 8 casualties. The assembly trenches previously dug were occupied by the two leading Coys, the two rear Coys digging themselves in. This was completed by 2.30am. 2.30am: Four Lewis Guns pushed forward under cover of darkness, to cover advance of attacking Coy. 4.30am: Battalion moves forward to line of deployment; movement carried out rapidly. 5.30am: General advance commenced in a very dense mist accompanied by smoke. Line well kept and touch maintained with Right and Left flanks. At first a little difficulty was experienced in locating the HINDENBURG front line but the appearance of a machine gun concrete emplacement soon removed all doubt on this point. The front line wire was found to be well cut and not much opposition was met with. A few prisoners were taken – 11 unwounded, 1 wounded, and sent to Battalion Headquarters. The enemy appear to have held this line by a number of posts at irregular distances. On the left a hostile bombing party endeavoured to push our men back but this was driven back by counter bombing. The third and fourth waves entered the trench according to orders and passed over it in lines of section columns, deploying after passing the front line. The mist was very dense. A small proportion of the 3rd and 4th waves appear to have reached their objectives but were compelled to return about 6.15am to the HINDENBURG FIRST LINE. 6.30am: It was now clear that the three attacking battalions were in the HINDENBURG FIRST LINE and consolidation was commenced at once. Our casualties in officers and men in the fighting between the 1st and 2nd lines were heavy. Captain WM Coulter MC, 2/Lt DO Muir, Captain AC Murray were all killed at this stage. 2/Lt S Coulter was severely wounded. 2/Lts Morrison, McGregor, Glendinning, Monro and Provan were also wounded. 2/Lt Morrison assumed command of D Coy and reinforced front line from 1st line by one officer and 20 men. He appears to have been himself hit about this stage and afterwards died from his wound. 2/Lt McGregor also died before he could be taken out of the battle. 2/Lt Maitland who appeared to be in support line sends back a message to say that a party of WORCESTERS have retired to first line but he is still holding on to his position. The orderly who brought the message had no idea of his position and could not find it again. 2/Lt Maitland is missing and it is feared his garrison also. 2/Lt AJ Walker sends a message to Bn HQs at 6.50am intimating the death of Muir and his taking command of the Coy. A Coy are reported to be in advance of the support line but he was not able to get touch. 2/Lt Andrew of A Coy is missing. 2/Lt Walker with 40 other ranks are determined to hold on at all costs. 2/Lt Maitland sends a message to say that he has passed the 1st line and appears to be left in the air about 50 yards from the second – he passed two rows of wire between 1st and 2nd line. No trace of a trench. He reports that Worcesters did not pass front line trench. He proceeds to consolidate and collects a few stray Worcesters. Later message from 2/Lt Walker states that a reinforcing party sent up to support line were driven back by bombing parties from the German line. Consolidation of the line becomes general and orders received from Brigadier General to hold on to the ground gained at all costs. Touch is gained with the Worcesters and the right and KRRC on the left and was maintained throughout the operations. 2/Lieut Greenshields took command of the position and held his ground with commendable credit throughout. 3pm: A hostile bombing party attacked along the communication trench towards the bombing block. This was immediately dealt with and in forty minutes, after a stiff encounter the [illegible] lay with us, a good many casualties were sustained by the enemy. Shortly after this one of the enemy was seen to approach with a white flag attached to his bayonet. On being shouted at he refused to move, but a bomb being thrown at him caused him to scream and make towards our men, surrendering himself and he was followed by fifteen others. Our bombing attack had done its work and this was part of the fruit. These prisoners were sent to battalion headquarters. A good deal of sniping was going on and carrying parties of the 1st Queens had 2 officers wounded and at least 20 other ranks. The stretcher bearers of the 101st FA and our own were constantly exposed to heavy shell fire in the SENSEE valley and battalion headquarters is shelled heavily throughout the day. At intervals the front line is shelled during the afternoon. 4pm: The Cameronians cross the SENSEE valley in artillery formation. The Adjt of the Cameronians and a few others were wounded by shellfire at this time. They share our very small headquarters and we are very closely packed. 5.30pm: Orders are issued for a fresh attack to be made to capture the support line of the HINDENBURG system. The 19th infantry brigade are entrusted with this task. 7.30pm: The attack of the 19th inf Bde commences. Our front line support the advance until the Cameronians pass through them. Conflicting reports arrive during the night but eventually it is clear that the attack has lost direction and nothing has been gained. During the night a certain amount of sniping goes on from the enemy lines, a good number of flares put up by them. We sent out patrols to try to capture enemy patrols but could not get in touch. We are satisfied that the enemy’s support line, our final objective is held by him in strength. About 50 prisoners were taken during the Cameronians attack. Quiet during the night. Battalion Headquarters is shelled a good deal during the day. Several killed and wounded. We are to be relieved tonight by the 1st Queens and 2nd Royal Welsh Fusiliers. Relief commences about 10.30pm and is completed by 4.30am 22nd. Battalion moves into support at Sunken Road in T17 a and c, our old Battalion Headquarters. 332883 Lance Corporal C. Brown was awarded the British War and Victory medals. 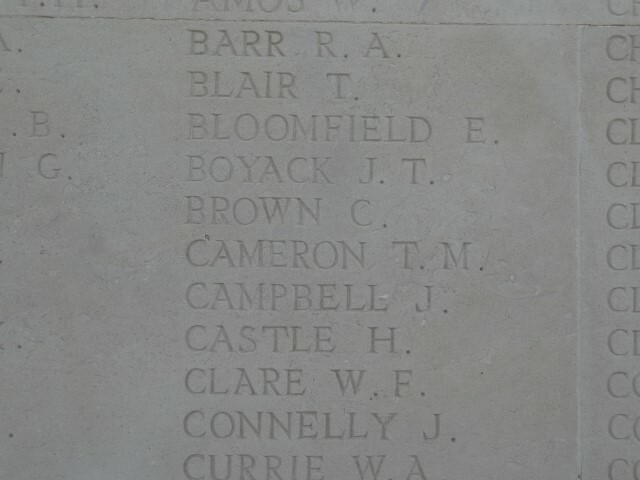 Lance Corporal C. Brown has no known grave and is commemorated on the Arras Memorial, France. 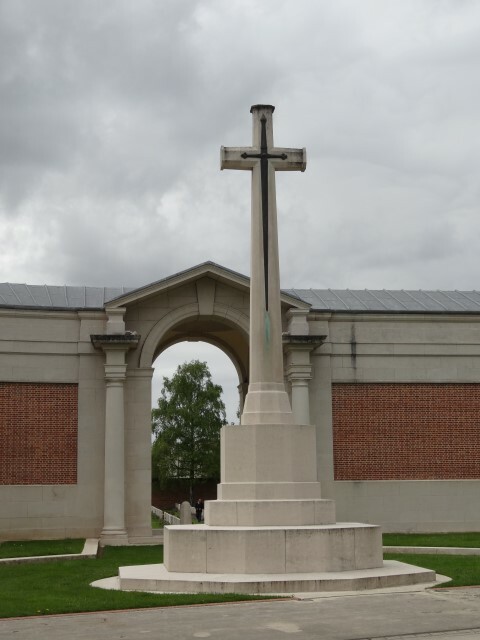 It commemorates almost 35,000 servicemen from the UK, South Africa and New Zealand who died in the Arras sector between the spring of 1916 and 7 August 1918 the eve of the Advance to Victory and have no known grave.